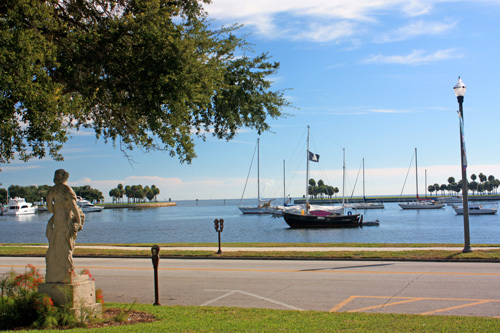 The St Petersburg Waterfront Parks run about 23 blocks along Tampa Bay in downtown St Pete. 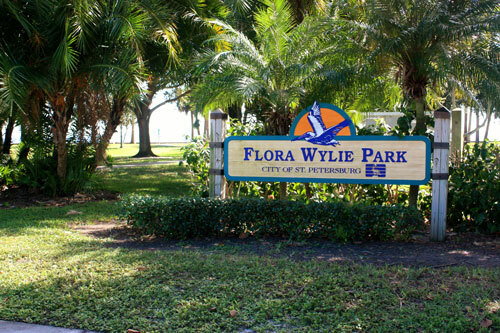 Your Florida vacation will be even more enjoyable if you spend an afternoon walking this beautiful stretch in St Petersburg FL. 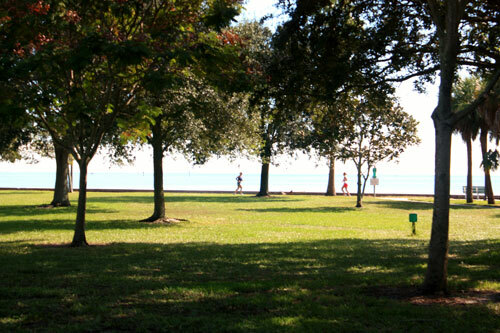 If you have small children, several of the parks have nice playgrounds that overlook the water. 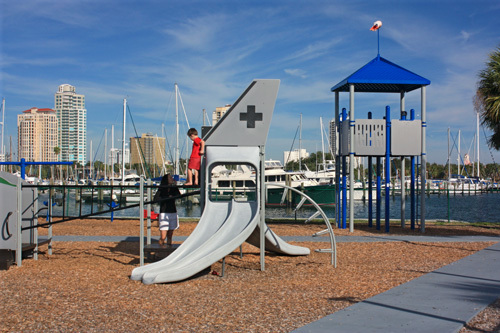 The St Pete waterfront parks are in continuous use from before sunrise to after sunset. You will meet hundreds of runners, walkers, and young mothers pushing new babies in strollers along the paved ribbon of sidewalk that connects the parks. There are plenty of benches for romantic moments, picnic tables for a quiet lunch in the shade while you smell the clean salt air, and plenty of grass for artists with their easels, kids flying kites, or dads playing catch with their son. 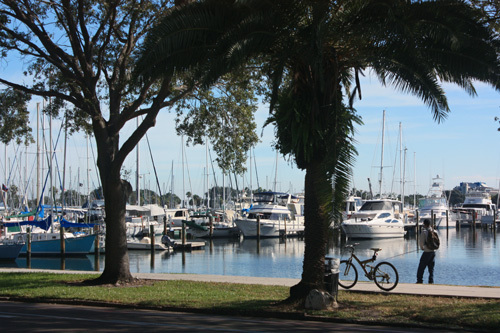 To me, St Pete FL is one of the most beautiful and livable cities in America. The St Petersburg waterfront parks just increase the attraction. 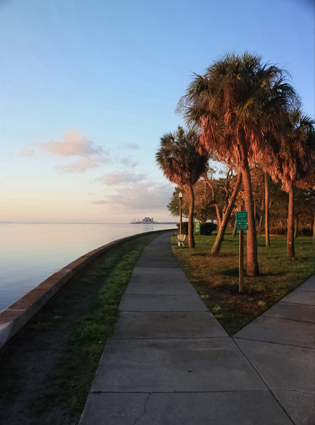 In December, 1909, the City Council finally decided to utilize the waterfront along Tampa Bay as a continuous belt of city parks. For three prior years, dating back to 1906, it had been a charged issue dividing backers who wanted it used to increase commerce with those favoring parkland. One of the most enthusiastic of those advocating public parks was W.L. Straub, the editor of the St. Petersburg Times newspaper. His editorials and forward-thinking approach gave impetus to one of the most beautiful and celebrated aspects of St Pete. Now, 100 years later, locals and visitors are continually thankful for his foresight. 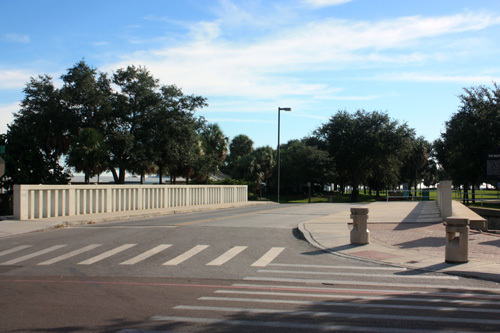 The park system along Tampa Bay starts just south of Coffee Pot Bayou at about 18th Avenue North on North Shore Drive NE and winds its way south to 5th Avenue South and Bayshore Drive. 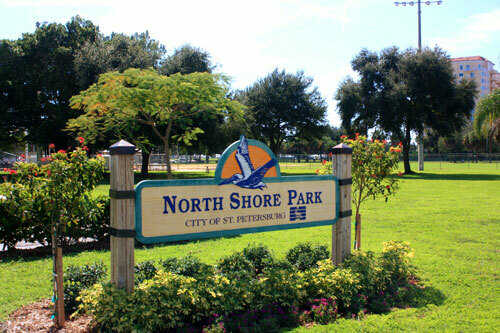 From each different park you can look eastward directly into Tampa Bay and you will always have a view of St Pete Pier. Come here at dawn and you will understand the pull of this beautiful stretch of grassy parkland. Don't be surprised if you make new friends easily out here. The waterfront parks have a sunrise culture all of their own. 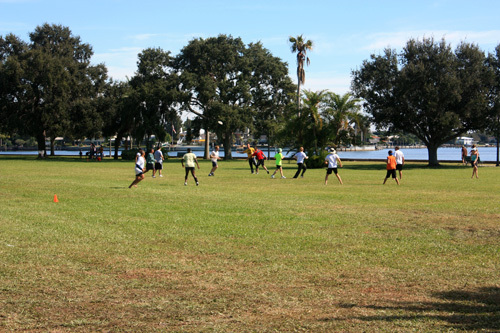 On Saturdays and Sundays, you can find lots of team Frisbee games being played. It is all good-natured and newcomers can always join in. Lots of people play barefooted. 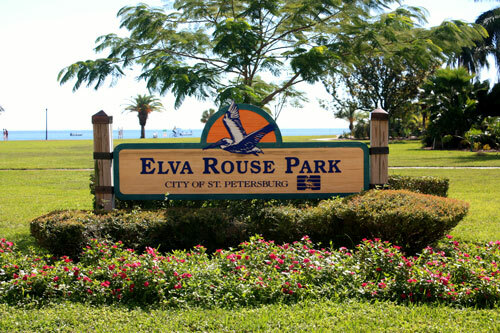 The next park south is Elva Rouse Park. 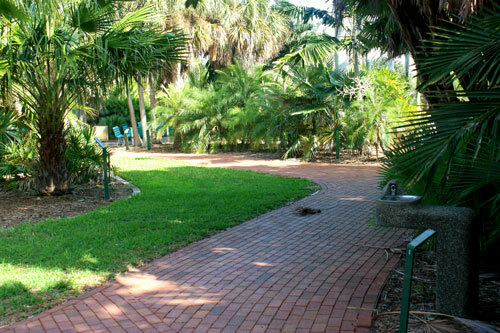 It is a quiet, more romantic setting where you can talk intimately or just watch the activity on the waterfront path. This is a nice park for a blanket and picnic. Gizella Kopsick Park is quite a departure from the flat grassy lawns you are used to seeing. This park is actually an aboretum with a huge variety of labeled plant life for those who enjoy science along with great scenery. The path linking the plants is made of brick to set off the beauty. North Shore Park is separated by a parking lot from Gizella Kopsick but the distance in activity level is light years. 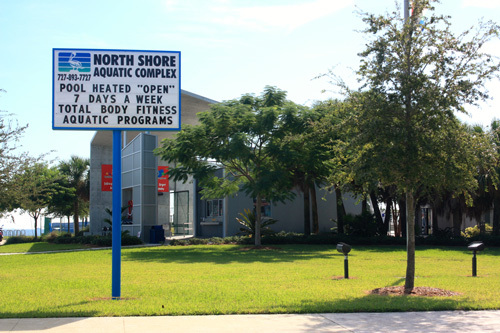 The centerpiece of this park is North Shore Pool, home of the highly successful St Petersburg Aquatics swim program and the St Pete Masters swim team. 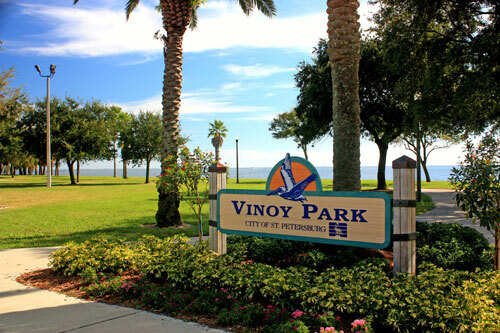 Winding south along the St Petersburg waterfront parks, we come to the vast open area of Vinoy Park. Many special events, such as jazz concerts and art shows are held in this park. 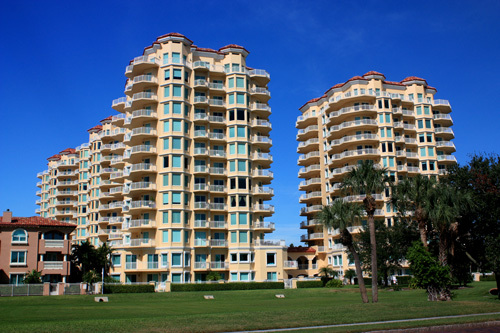 Directly across from, and facing Vinoy Park are the beautiful Vinoy Condos. Many residents have powerful telescopes in their front windows to watch the large ships and weekend boaters out in Tampa bay. 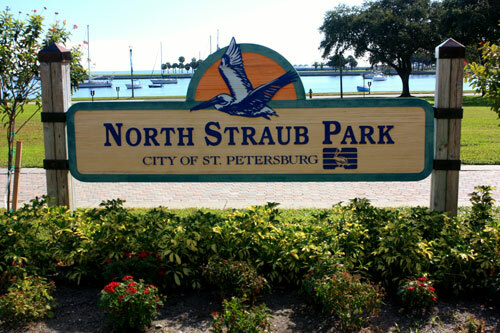 Continuing south to 5th Avenue North, we come to North Straub Park, named for the forward-thinking editor of the St Petersburg Times, W. L. Straub. 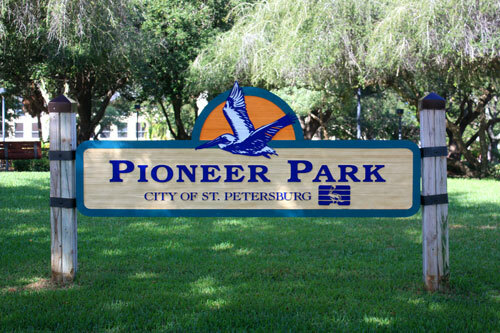 This park has more benches than the previous ones, simply because it is closer to downtown St Pete and The Pier. You'll find a lot of people reading here or just observing the boats out in the Vinoy Basin. 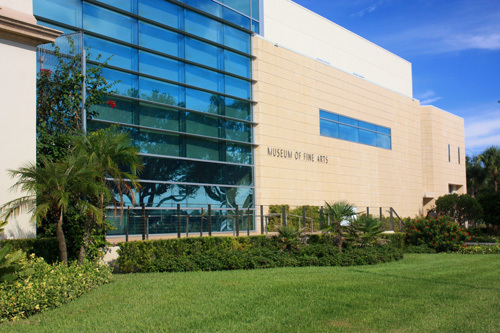 The Fine Arts Museum separates North Straub Park from South Straub Park along the St Petersburg waterfront parks system. 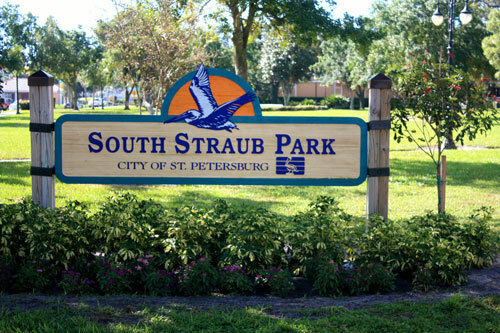 South Straub Park is pretty similar to it's brother on the other side of the St Petersburg Fine Arts Museum. 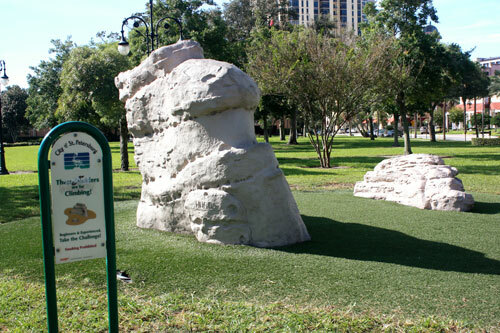 One unique aspect of South Straub Park is the rock-climbing structure for children. Pioneer Park is next on our tour. Pioneer Park is small, quiet, and covered with many flowers. It is less open and more intimate than the larger areas we just visited. Although shielded by flowers and plants, you can rest on the comfortable benches and watch people fish the Municipal Marina waters. We are coming close to the end of our tour of the St Petersburg waterfront parks. 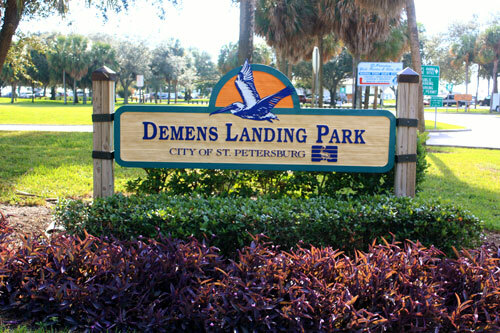 Directly across the street from Pioneer Park is the bridge entrance to Demens Landing Park. This is home to the offices of the St Petersburg Municipal Marina and most of the parking is for those with marina permits. The parking for Demens Landing Park is at the far east end. Do not try to park in Lots A, B or C after this sign. 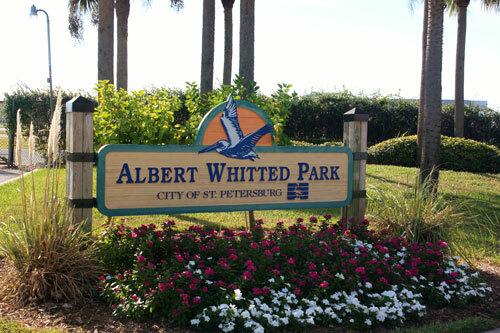 The final stop of the St Petersburg waterfront parks tour is Albert Whitted Park, located at 5th Avenue South and Bayshore Drive. 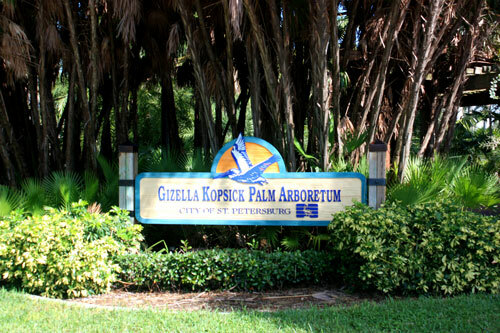 It is a long, narrow strip of land that runs about 400 meters directly towards Tampa Bay. It ends at a nice, clean playground for small children. You will normally find young mothers frequenting this park. 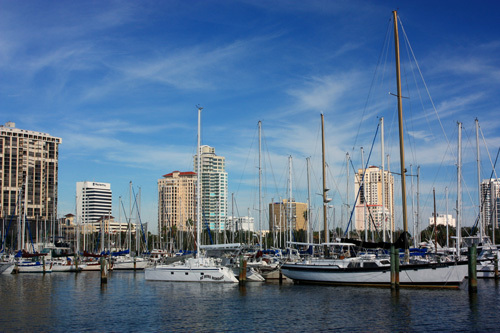 What I like best about Albert Whitted Park is the outstanding view of downtown St Pete across the Municipal Marina. It doesn't really get much more beautiful. 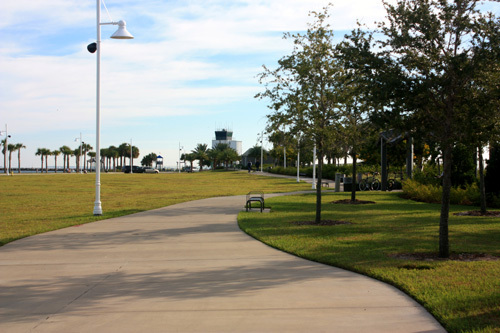 I hope you get the opportunity to visit the St Petersburg Waterfront Parks System. It will be well worth your time while exploring downtown St Pete FL.